Soap is an artform. Truly, I realize you use it for bathing and getting clean, but there is an art to making soap, especially the beautiful quality soaps made at Philo Soapy USA. Danielle uses her artistic flare to create unique glycerin style soaps. Soap that looks like artwork, but is usable as well. I was able to review 2 soaps from Danielle. In celebration of Fall, the pumpkin soap. Perfect size for your hands. Smells so full of fall! The Lemon Verbana Cucumber had a Loofah inside. Even hubby commented on how he liked this soap! I loved the smell, and it was a great exfoliating soap when you were to the loofah. It does become more exfoliating as the soap is used though, so be careful. 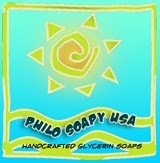 All of Philo Soapy USA soaps are handmade and designed with love. Over 30 fragrances are available. The soaps change seasonly as well. I really love the ice cream cone and ice pops for the summer months. I haven't had the opportunity to work with glycerin much, but it definitely seems to be a soap that is easier to create with. Enter to win $15 Gift Certificate from Philo Soapy USA!! arge;">What are your favorite soaps?? I like the Raspberry Ice Pop soap. I like the Chocolate Ice Cream Cone. My favorite soap would have to be the Choco Coco Ice Cream Cone. The Lemonade Ice Pop is cool! I would love the watermelon soap. Lemonade Ice Pop would be fun! I like the lemonade ice pop-in either design since the halloween skull design is cute too. I would love to have a couple of the Big Round Loofah soaps. I would like to try it for myself but they would also make great gifts. I like the blueberry ice cream cone. I like the Vanilla Ice Cream Cone Soap. My fave soap is their black coffin soap. It'll be a must for next Halloween. I like the Big Round Loofah soap.